[Jews are busy cocking up something that would otherwise have been good and of course their real goal is to make money out of it while producing zero output. This is so annoying in what otherwise could have been some real serious science funded by private people who are fascinated by a real mystery. What we need in this story are some Europeans, preferably NAZI scientists, to get to the bottom of the real problem and add actual knowledge, rather than the emotional Jewish blather that I’m going to describe to you, which, frankly, annoys the hell out of me. I stumbled upon a fascinating scientific mystery. The science is this: The US Navy, in searching for Russian submarines set up a hydrophone system in the oceans. The US Navy began to realise that their hydrophones are picking up the noises made by whales which are of low frequency and which are similar to the frequencies of these Soviet submarines. Later the military allowed scientists to use their hydrophone system, and scientists found it awesome to suddenly have a network whereby they can track whales, etc. The whale noises fall into a certain frequency, except for one. A team of scientists, working with the Navy, discovered a single whale that made noises at quite a different frequency of 52 Hz. For a few years, they found that this single animal could be tracked for part of the year as it swam around the area in this map below. There is no other animal in the sea that makes noises of this frequency. This is truly, a single, lone animal. It became known in the public as “the loneliest whale” giving out its call for a mate and never finding one, and therefore it is “lonely” and it will die, etc. Scientists are certain that this is a whale, or a hybrid of two whales. Because this creature is unique, and because it has again been tracked for 12 years, it is theoretically possible to find it. Its “voice” has deepened a bit, indicating that it has matured. Scientists don’t think its “lonely”, because they say other whales will be able to hear it, despite the different frequency. In fact, they think it is a healthy animal. It swims 700 Km in quiet years, but when it is energetic, it can swim up to 11,000 Km in a single year! So people began wondering if this creature couldn’t perhaps be tracked and found since its sound is so unique. A New York Jew who does films then went and decided he will do a documentary about the whale and “find the whale”. He raises money for his project in 2015, does a trailer … and … zero output. I didn’t know originally, this was a Jew. I just wanted to find out if someone had made the documentary and whether they had found the mysterious whale. I hunted and hunted, and began to wonder, due to the zero output, whether, once more, we are dealing with Jews, and hey presto, there indeed I discover that this is so. Get money, talk a lot of Jew nonsense, promise an output, get publicity … and apparently, the documentary is due out now in 2018. Yes, scientists are involved. The Jews and scientists went and recorded lots of whales “singing” and did all kinds of stuff … except finding the mystery creature that is of REAL IMPORTANCE HERE! Grrrrr. Its clear the Jew is already deflecting, because when asked about the mystery creature the Jew is already talking about the importance of the human emotional response to this creature “crying” in the ocean. The Jew has been asked: “Did you find the whale?” – well, the Jews’ scientists tell all sorts of things, but nobody is talking about whether they found it … this will be the big surprise at the end of the documentary/movie that will be launched this year. I can already predict the outcome: The Jew never went searching for the whale. The Jew and Jews’ scientists have made ZERO progress on finding the animal, which the bloody money was for in the first place. The original requirement was that people would donate money for a documentary and the goal was to search for the creature. Clearly, the Jew science is not up to this task, but a Jew and money … well, the money is what is really important isn’t it? So instead they grab some scientists, do some other nonsense to do with whales and we’ll have the documentary. Money will have been spent, time will have been wasted and ZERO SCIENTIFIC PROGRESS WILL HAVE BEEN MADE, and instead people will be paying to watch a “documentary” that is about everything except the original mission. What a f*cking disappointment I can tell you. A genuine mystery … a unique opportunity to hunt this creature and try to find it … instead money and time is wasted; there’s a whole lot of deflection, and ZERO PROGRESS. This is exactly like here in Africa I tell you. I’ll post some links. Then you can go and see for yourself. Here’s something genuine, that someone technical could try to solve, instead of taking people’s money, deflecting and talking about emotion (that’s another Jew trick I’ll tell you about – the inclusion of EMOTION in Jewish thinking). Total bloody waste I tell you. Find the animal, so that we can see what it actually is like, and we can study it! There’s definitely going to be some scientific knowledge that will come out of the process. But the Jews are busy screwing up what otherwise is a fun mystery that stacks of people are interested in! In 2015, the Jew put out this trailer about the coming documentary on finding the whale. It says clearly the SEARCH for the whale! Notice Jew names popping up in this. Notice in this stupid trailer the endless focus on EMOTION instead of science and that people want to find the animal. This is just Jew deflection and Jew nonsense instead of white science. You’ll see donate, and a lot of Liberal pointless talk, but … zero actual progress. It seems the documentary will be launched on October 17, 2018 in New York. Here is some stuff from the above link, to show you all the Jewish CRIMINALS that interest this guy!!!! One of his favorite books is “Tough Jews” by Rich Cohen, about Jewish gangsters in the 1940s and 50s. The 52-hertz whale is an individual whale of unidentified species, which calls at the very unusual frequency of 52 Hz. This pitch is a much higher frequency than that of the other whale species with migration patterns most closely resembling this whale’s – the blue whale (10–39 Hz) or fin whale (20 Hz). 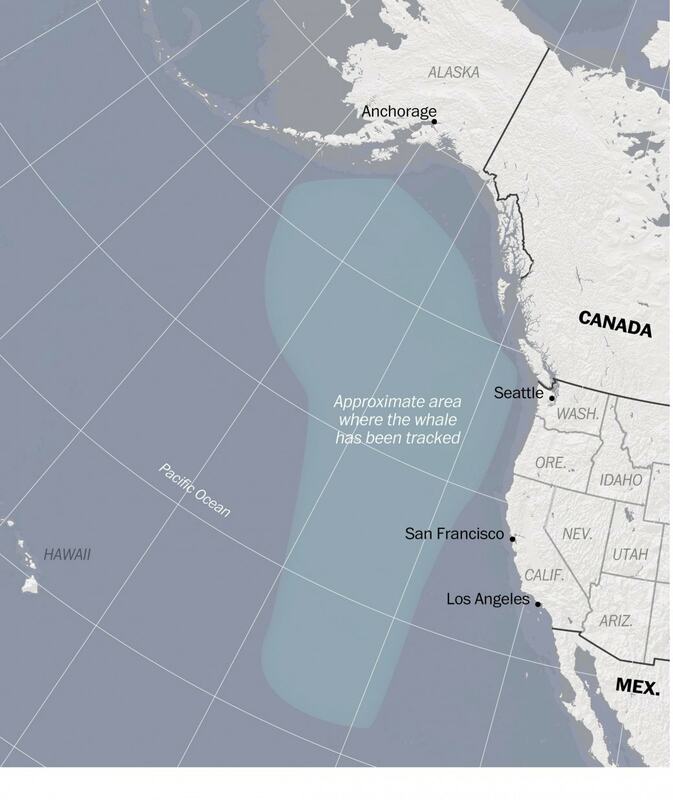 It has been detected regularly in many locations since the late 1980s and appears to be the only individual emitting a whale call at this frequency. It has been described as the “world’s loneliest whale”. The sonic signature is that of a whale, albeit at a unique frequency. At 52 hertz, it is just higher than the lowest note on a tuba. The call patterns resemble neither blue nor fin whales, being much higher in frequency, shorter, and more frequent. Blue whales usually vocalize at 10–39 Hz, fin whales at 20 Hz. The 52-hertz calls of this whale are highly variable in their pattern of repetition, duration, and sequence, although they are easily identifiable due to their frequency and characteristic clustering. The calls have deepened slightly to around 49 hertz since 1992, suggesting the whale has grown or matured. The track of the 52-hertz whale is unrelated to the presence or movement of other whale species. Its movements have been somewhat similar to that of blue whales, but its timing has been more like that of fin whales. It is detected in the Pacific Ocean every year beginning in August–December, and moves out of range of the hydrophones in January–February. It travels as far north as the Aleutian and Kodiak Islands, and as far south as the California coast, swimming between 30 and 70 km each day. Its recorded distance traveled per season has ranged from a low of 708 km to a high of 11,062 km in 2002–03. Scientists at the Woods Hole Oceanographic Institution have been unable to identify the species of the whale. They speculate that it could be malformed, or possibly a blue whale/fin whale hybrid. The research team has been contacted by deaf people who believe the whale may be deaf. Whatever biological cause underlies its unusually high frequency voice does not seem to be detrimental to its survival. The fact that the whale has survived and apparently matured indicates it is probably healthy. Still, its unique call is the only one of its kind detected anywhere and there is only one such source per season. Because of this, the animal has been called the loneliest whale in the world. The 52-hertz whale was discovered by a team from the Woods Hole Oceanographic Institution. Its call was first detected in 1989, then again in 1990 and 1991. In 1992, following the end of the Cold War, the U.S. Navy partially declassified the recordings and technical specifications of its SOSUS anti-submarine hydrophone arrays, and made SOSUS available for oceanographic research. As of 2014, the whale had been detected every year since.